Bring 1¾ cups water to a boil in sauce pan with tight fitting lid. Add rice and pinch of salt. Cover and reduce heat to a summer. Cook for 12 minutes or until water is absorbed. Set aside. While the rice is cooking, make the dressing. Combine lemon juice, GrapeOla Grapeseed Oil, maple syrup, and salt and pepper to taste. Set aside. 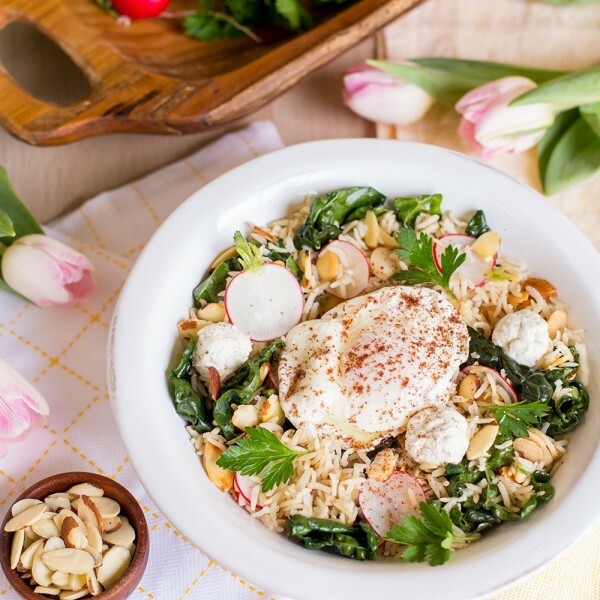 Combine kale, radishes, almonds, parsley, and toss in the dressing. Serve warm, with poached eggs.